North Korea’s state media has reported Kim Jong Un’s first public statement about a possible summit with President Trump. 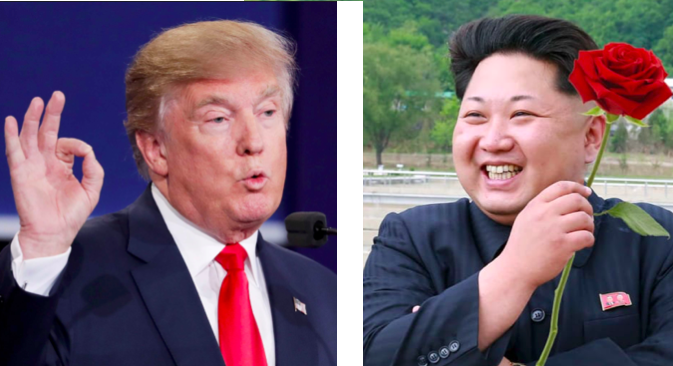 Last month, President Trump agreed to hold talks with the nuclear-armed DPRK — which would be the first between a sitting US president and a North Korean leader. No date or venue have been set, and questions had been mounting over Pyongyang’s sincerity in offering to talk. However, a report on Pyongyang’s official KCNA news agency today (Tuesday, April 10) said that Kim discussed the “development of the north-south relations and the prospect of the DPRK-US dialogue” yesterday. It also said he delivered a report “on the development of the recent situation on the Korean peninsula”, and also mentioned a separate summit to be held with South Korea later this month. In a growing rapprochement on the Korean peninsula, Kim is scheduled to meet the South’s President Moon Jae-in for a North-South summit on April 27. President Trump has agreed to meet Kim for what would be an historic summit to discuss denuclearisation “as soon as next month”. However, the DPRK had remained tightlipped about the possible talks since Kim’s offer of a dialogue was delivered to President Trump by South Korean diplomats last month. This silence had reportedly made some in the White House nervous that Seoul had overstated the North’s willingness to discuss its nuclear arsenal and missile programmes. Kim’s remarks yesterday have broken this silence, although he did not specifically refer to a “summit” with the American president. Amid media reports of back-channel talks continuing between the two rivals, President Trump said yesterday that he planned to meet Kim in “May or early June”. “I think there will be great respect paid by both parties and hopefully there will be a deal on de-nuking,” he said. Kim’s offer of talks came after a year of heightened tensions which has seen the DPRK fire multiple missiles and carry out its most powerful nuclear test to date. The situation began to thaw after the North sent a delegation to the Winter Games in the South in February, Then, last month, Kim made his first public overseas trip with a visit to Beijing.